* I used big idli mould, so i needed more batter. 1 cup of batter is enough if you use medium sized moulds. Boil the potato and mash it roughly with hands. In a pan add oil and add in the mustard seeds and urad dal. Add finely chopped green chili and curry leaves. Saute for few seconds and add the onions. Mix well and add salt and turmeric powder. Mix well and mash the mixture nicely. It should come as a whole mass. Do not add any water. If you feel that the mixture is too dry, just sprinkle 1 tsp of water. Cook for a minute and switch off the flame. Add coriander leaves. Potato stuffing is ready for Stuffed idli. Make equal sized balls and flatten them. Flattening them makes it very easy to stuff inside the idli. Grease the idli mould and add little batter to it. Fill the mould half. Place one potato patty on this. Pour little more batter to cover the stuffing. Steam this for 7-8 minutes. You can insert a tooth pick on the edge of the idli to check whether it is done or not. If it comes out clean, it is done. Take out from the pan and after 2 minutes take the idlis out from the mould. Cut them into half and serve it as a idli. If making idli bites, put idli milagai podi in a plate. Mix this with sesame oil. 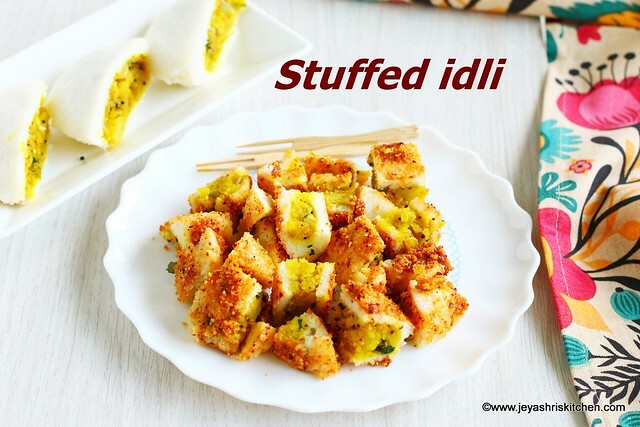 Roll the whole stuffed idlis with milagai podi and get them evenly coated. Cut them into small bite sized pieces. Pack them for lunch box or serve it as a tea time snack. You can serve the stuffed idlis with coconut chutney too. I tried this with a variation of add ghee in a pan and put the cut stuffed idli to the pan. Smeared molaga podi on this and gently gave a good mix. It tasted so well too. You can make the stuffing with the left over potato curry too. You can do this with any stuffing too. 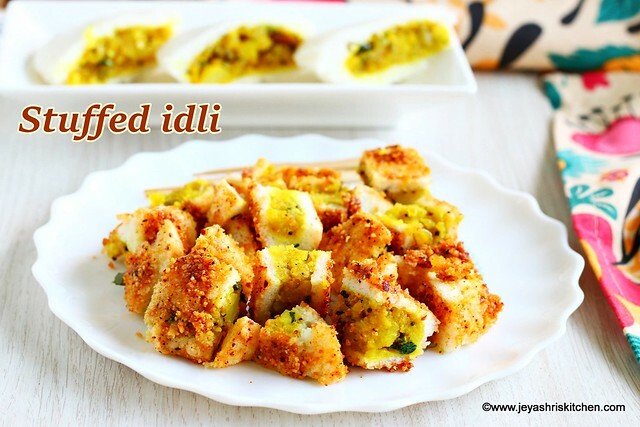 Be creative and innovative with your thinking and make variety of idlis with the simple idli batter. I will share some more ideas for stuffed idli in Jeyashri's kitchen Instagram page soon. Tried this today... had ragi idli batter ready in hand.. so tried with that came out well.. yet to give it to my children.. wl def. Enjoy.. am sure..